I love books, Janette Rallison, and Twilight, so anything that combines the three works well for me! I love my LDS authors – you, Stephenie, Shannon, Mette, Jessica, etc. I would love a copy! I would rather hear about Jacob than Edward, but hey, any new book is welcomed in my library. Ooo, ooo, that would look so good next to all my signed Project Book Babe Books (including a fabulous My Fair Godmother by a wonderful author who was so sweet when I met her that day *winks*) And I swear I’m not just saying that to score points! I think it would be great to see your writings on Twilight! What a great idea…I’d love to enjoy this book! I am glad you let us know about this book. I hope I win, as I will have to buy it if I don’t. I’d love to read it. Sounds intriguing! Hope I win! Pick me! Pick me! I’m am a HUGE fan of yours, I love your books. I just received a copy of Deep Blue Eyes that I can’t wait to start. I’m also a huge Twilight fan and this book sounds awesome. I’d love to be entered in the giveaway!! Seriously though I am just like all the other fans here, I love to read, I love the series and I love your books. You are so much fun. I am blessed just to have met you & to have journeyed into the lives you have created. I would love it! If it can’t be me, then let it be megs. She seems to really need some new twilight material. Love your stuff! I just sent a link from your blog to two of the district librarians. I’m sure they will look for this one! I think it is intersting that there is a book about twilight. Usually, we wait until the artist is dead before we recognize them in this way. Is this book supported by Stephenie Meyer? I don’t know what the essays cover, but the whole Twilight thing has changed reading. I, like many comments before me, love to read. I have a sad addiction, one I try to cure, but to no availe I still buy books instead of clothes or food. Help me out!! ok. i neeeed that book. i can offer you something in return… my unborn child perhaps…? The publishers of this book, Teen Libris, do a whole series of books about other authors’ series. I also did a chapter in Mind Rain which is about Scott Westerfeld’s Ugly series. He edited that book–which was really cool, because he knew the series better than anyone. He could tell us to add details or consider different things. It was really neat to work with him. 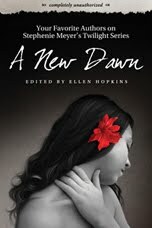 Stephenie didn’t edit this book–I wish she had, but I think she was busy writing Breaking Dawn at the time. So this is completely unauthorized. Is it too late to throw my hat in the ring? I’d love a shot at this book! I read about this book and always wanted to read it.